Here is the picture of the gates of the underworld's map. The gates of the underworld is the world of the dead people. The reasons of the dead people are death,disease, sleep , dreams and so on. The gates of the Underworld was ruled by the god Hades, the King of the Underworld is Persephone, It is location is in a subterranean region. 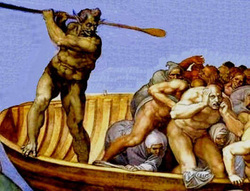 Charon was charge of ferrying the souls of the dead people (both good and evil) across the River Styx and the River Acheron. His father was the god Erebusc ( god of Darkness) and his mother was Nyx ( god of Night). He didn't married therefore, he didn't have wife. Charon means terrible reminder of the life . Hissymbols is pale or oar of a boatman and the double heated hammer.